People keep Anglo-Nubian and Nubian goats primarily as dairy goats. Anglo-Nubians and Nubians don't produce as much milk as Swiss goats, but their milk has higher butterfat content. They also have a longer breeding season than Swiss and other dairy goats, so they can produce milk year-round. Although goat breeders historically distinguished between the Anglo-Nubian and Nubian breeds, in modern times the main difference is one of semantics. In the late 1800s, Nubian goats gained popularity with British goat breeders. These goats got their name from the desert region of the Sudan, although many of them actually came from India. The term Nubian described any goat from northern Africa, India or the Middle East that had the same Roman nose, long ears and tall stature present in India's Jumna Pari breed and Egypt's Zairaibi breed. In the United Kingdom, purebred Nubian goats were crossed with British goats to produce the Anglo-Nubian goat, recognized as an independent breed in 1896. Jumna Pari goats were bred in India for meat as well as milk. Like their Anglo-Nubian descendants, they were tall goats, but more slender and usually horned. In 1933, horned goats could not be registered as Anglo-Nubians -- the rule was later lifted; modern Anglo-Nubians may have horns. Zairaibi goats were tall like Jumna Pari goats but thicker, with protruding lower jaws. Because they originated in India and Africa, these hardy animals were used to improve British goat breeds that don't do as well in warmer climates and have shorter breeding seasons, creating the Anglo-Nubian breed. 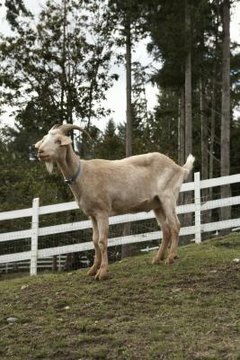 The first Anglo-Nubian goats hit the shores of the United States in 1896, but the Anglo-Nubian breed wasn't established in America until 1913. A California breeder imported two bucks and three does, and these animals are the ancestors of most purebred Anglo-Nubian goats in the United States. Curiously, when the breed was officially established in the United States between 1909 and 1918, "Anglo" was dropped from the breed's name. Although still called Anglo-Nubian in the United Kingdom, goats of the same breed are called Nubian goats in America. The American Dairy Goat Association recognizes the Nubian breed, which are actually goats of Anglo-Nubian stock and descent. Goat owners register a Nubian as purebred if it is the offspring of two registered purebred Nubian parents. Perhaps confusing things further, a goat may be registered as an American Nubian. American Nubians may have at least one parent that isn't a registered purebred as long as they otherwise meet the Nubian breed standard. To qualify as an American Nubian, a goat's dam and sire, if not purebred, must come from at least three successive generations of ancestors that conformed to breed standards. Thus, the usage of "American" refers only to the goat's registration lineage -- American Nubian is not a breed apart from Nubian or Anglo-Nubian goats.